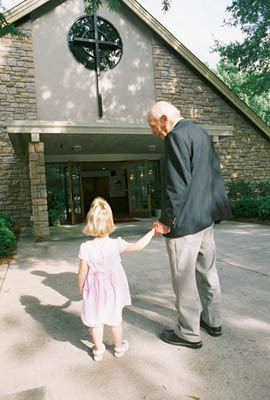 At Western Boulevard Presbyterian, we recognize that our children and youth are the future of our Church. We are committed to developing meaningful worship experiences for young people from their earliest days in the Church all the way through High School and beyond. Children ages 4-year-old through 2nd grade are invited to leave the Sunday morning worship service (except the 1st Sunday each month when we take communion together) to experience God’s presence in their special chapel located in Room 211. The Godly Play curriculum uses an experiential discovery method to engage the whole child – hands, heart, mind, senses and intuition. Bible stories are told with three-dimensional materials and children are encouraged to move into larger dimensions of belief and faith through ‘wondering questions’ and personal response time. 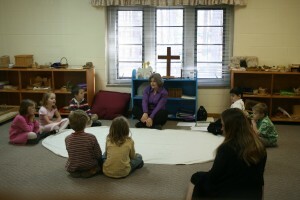 Next time you see one of the young people in our Church, ask her what she learned in Children’s Chapel. You may be quite surprised at the stories our children have to tell. During the summer, our church offers an incredible Vacation Bible School program. This week-long program allows children from ages four to fifth grade to spend three hours each morning learning about God in an exciting and creative atmosphere. At our most recent Vacation Bible School more than 75 children experienced the joy of worshiping God together. Children learn that our God is wonderful, awesome, incredible, amazing, and magnificent through Bible Stories, songs, crafts and recreation. Through rockin’ contemporary music, costumed Bible study, larger-than-life recreation games and cool challenging crafts, kids will learn how to live as God’s children.